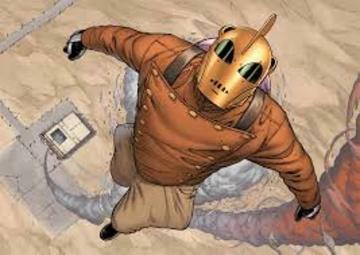 The Rocketeer is a fictional superhero appearing in comic books originally published by Pacific Comics. Created by writer/artist Dave Stevens, the character first appeared in 1982 and is a homage to the Saturday matinee serial heroes from the 1930s through the 1950s. The Rocketeer's secret identity is Cliff Secord, a stunt pilot who discovers a mysterious jetpack that allows him to fly. His adventures are set in Los Angeles and New York in 1938, and Stevens gave them a retro, nostalgic feel influenced by the King of the Rocket Men and Commando Cody movie serials (both from Republic Pictures), and pinup diva Bettie Page. The character was adapted into the 1991 Walt Disney Pictures film The Rocketeer by director Joe Johnston.